In fig. given below ΔACB ∼ ΔAPQ. 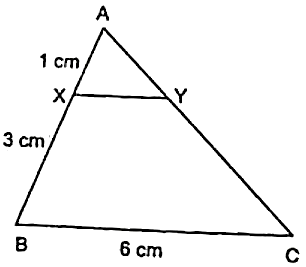 If BC = 8 cm, PQ = 4 cm, BA = 6.5 cm, and AP = 2.8 cm find CA and AQ. Therefore, CA = 5.6 cm and AQ = 3.25 cm. In fig. given, AB ∥ QR, find the length of PB. In fig. given, XY∥ BC. Find the length of XY. 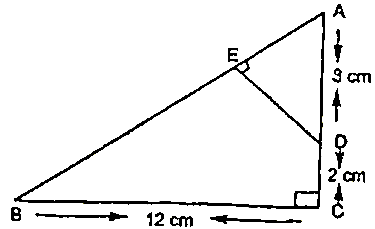 In a right-angled triangle with sides a and b and hypotenuse c, the altitude drawn on the hypotenuse is x. Prove that ab = cx. In fig. given, ∠ABC = 90 and BD⊥AC. 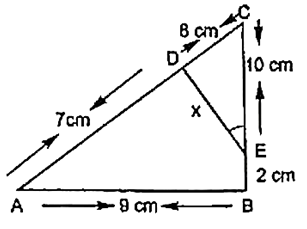 If BD = 8 cm, and AD = 4 cm, find CD. When, BD = 8 cm, AD = 4 cm, we need to find CD. 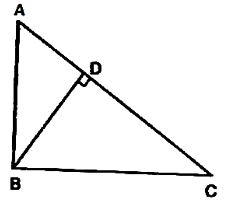 Since, ABC is a right angled triangle and BD⊥AC. In fig. given, ∠ABC = 90 and BD ⊥ AC. 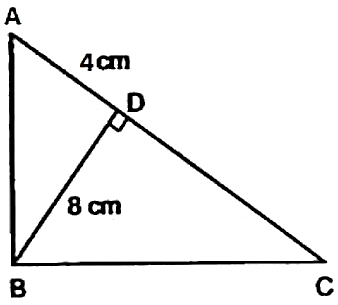 If AC = 5.7 cm, BD = 3.8 cm and CD = 5.4 cm, Find BC. Given:  BD ⊥ AC. 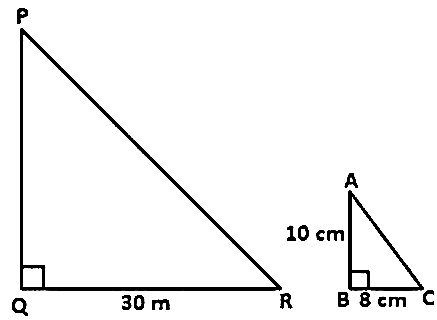 AC = 5.7 cm, BD = 3.8 cm and CD = 5.4 cm, and ∠ABC = 90. In the fig. 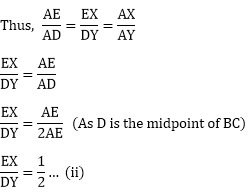 given, DE ∥ BC such that AE = (1/4) AC. If AB = 6 cm, find AD. 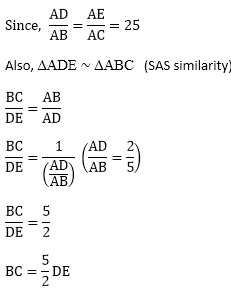 Given, DE ∥ BC and AE = (1/4) AC and AB = 6 cm. We need to find AD. 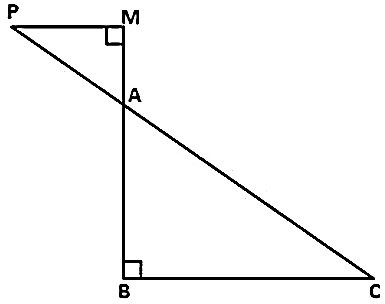 Given trapezium ABCD with AB∥DC. 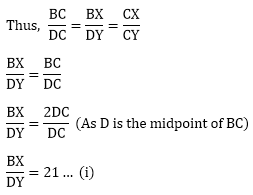 OC is the point of intersection of AC and BD. 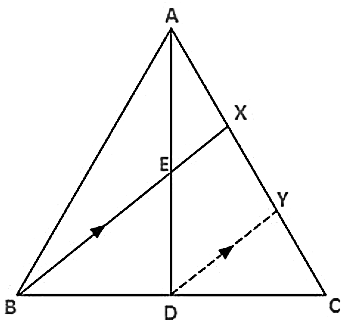 (i)  Given Δ ABC and Δ AMP are the two right angled triangle. A vertical stick 10 cm long casts a shadow 8 cm long. At the same time, a tower casts a shadow 30 m long. Determine the height of the tower. We need to find the height of PQ. In fig. given, ∠A  = ∠CED, prove that ΔCAB ∼ ΔCED. Also find the value of x. 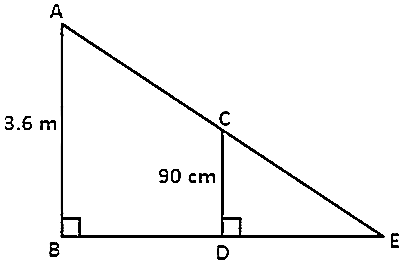 The perimeters of two similar triangles are 25 cm and 15 cm, respect. 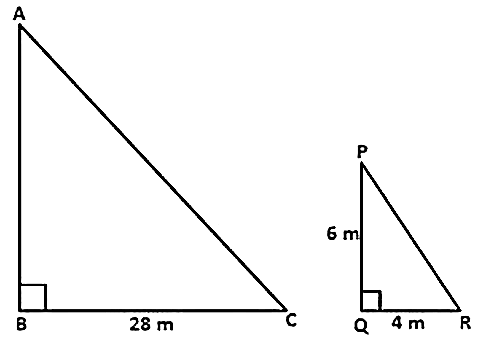 If one side of the first triangle is 9 cm, what is the corresponding side of the other triangle? We need to find the other side. 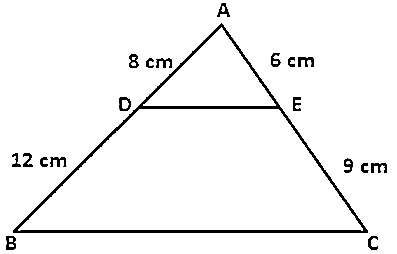 In ΔABC and ΔDEF, it is being given that AB = 5 cm, BC = 4 cm, CA = 4.2 cm, DE = 10 cm, EF = 8 cm, and FD = 8.4 cm. If AL ⊥ BC, DM ⊥ EF, find AL: Dm. Here, we use the result that in similar triangle the ratio of corresponding altitude is same as the ratio of the corresponding sides. 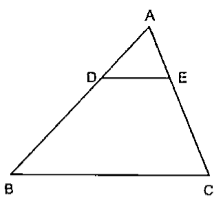 D and E are the points on the sides AB and AC respectively, of a ΔABC such that AD = 8 cm, DB = 12 cm, AE = 6 cm, and CE = 9 cm. Prove that BC = 5/2 DE. 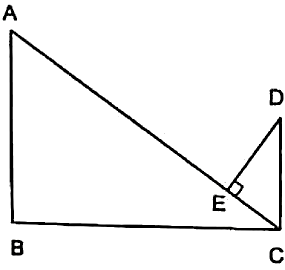 ABC is a triangle in which D is the midpoint of BC, E is the midpoint of AD. 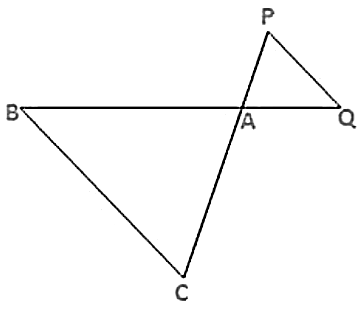 BE produced meets AC at X.
ABCD is a parallelogram and APQ is a straight line meeting BC at P and DC produced at Q.
ABCD is a quadrilateral in which AD = BC. 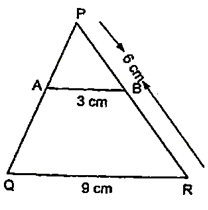 If P, Q, R, S be the midpoints of AB, AC, CD and BD respect. 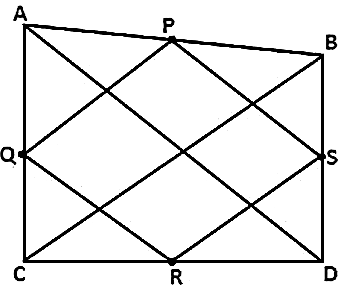 Show that PQRS is a rhombus. 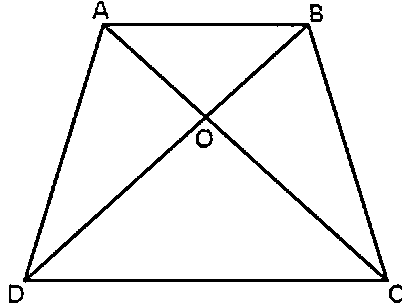 Given, ABCD is a quadrilateral in which AD = BC and P, Q, R, S are the mid points of AB, AC, CD, BD, respectively. PQ ∥ BC, PQ = 1/2 BC. 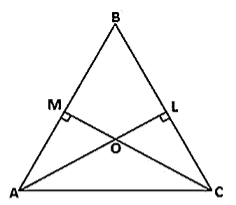 We need to prove that ΔAPC ∼ ΔBCQ. 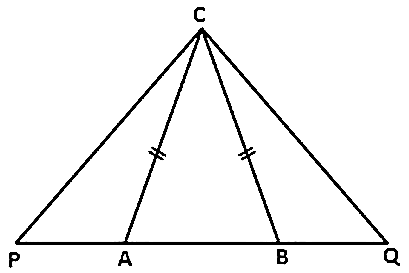 Given ΔABC is an isosceles triangle AC = BC. A girl of height 90 cm is walking away from the base of a lamp post at a speed of 1.2 m/sec. If the lamp is 3.6m above the ground, find the length of her shadow after 4 seconds. We need to find the length of her shadow after 4 sec. A vertical stick of length 6 m casts a shadow 4m long on the ground and at the same time a tower casts a shadow 28m long. Find the height of the tower. Suppose AB is the height of the tower and BC is its shadow. Hence, the height of tower is 42 m.
In the fig. 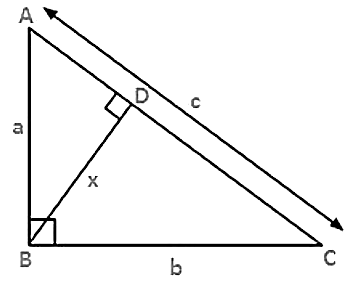 given, ΔABC is a right angled triangle at C and DE ⊥ AB. Prove that ΔABC ∼ ΔADE. 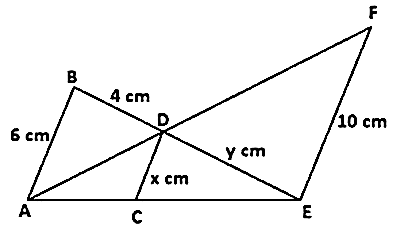 We need to prove that ΔABC ∼ ΔADE and find the length of AE and DE. In fig. given, we have AB ∥ CD ∥ EF. If AB = 6 cm, CD = x cm, EF = 10 cm, BD = 4 cm, and DE = y cm. Calculate the values of x and y.
AB = 6 cm, CD = x cm, and EF = 10 cm.